While we do still not know the exact causes of laminitis (inflammation of the lamellae) and the resulting founder (rotation or sinking of the coffin bone), there are quite a few factors we know will possibly lead to laminitis. Management errors are the culprit. Most grass pastures have been planted with grasses intended to fatten up cows. They are especially rich after being fertilized with chemical fertilizer. The horse is greedy for the new grass and at the same time not worked enough. Today we have a term for the resulting disease: Metabolic syndrome. The circulation of toxins in the blood stream, be they chemical, viral or bacterial, predispose a horse to laminitis. When an excess of rich food is consumed, as it is digested, the acidity of the bowel contents increases. Above a certain acidity the normal bacterial population of the bowel are killed and replaced by bacteria which can survive in the changed conditions. The cells of the original bacteria contain toxins which are released when they die and are absorbed through the bowel wall into the horse’s circulation. Under certain conditions and in combination with hormones, these toxins in the blood stream can lead to closing down the arterial supply to the laminar corium, which has been shown to be the first change in laminitis. It may happen that a horse has an injury on one leg and therefore is overstressing the other hoof by bearing more weight on it than usual. Also horses ridden for very prolonged periods of time on road or similar hard ground may suffer from mechanical laminitis. The former is the fault of the hoof care professional, the latter that of the owner. 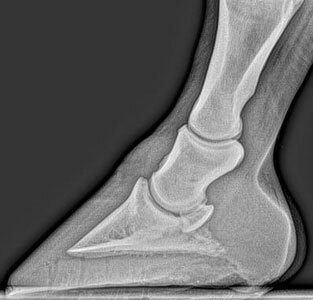 When the horses’ hoof form is not kept within physiologically correct parameters (short toes, low heels) the stresses on the laminar connection often lead to laminitis. Long periods between trims (longer than 4 –6 weeks) compound a bad trim. Horses with hoof deformities are even more at a peril with irregular hoof care. Some drugs, especially the corticosteroid group of compounds, are known to cause laminitis. This group of drugs is often administered to horses with midline dermatitis to give them relief from biting insects. Spring vaccinations are often given all at once (58 different vaccinations in one veterinary visit) and an already compromised body may respond with a laminitic episode. Worming may trigger laminitic responses as well. It is not uncommon for elderly animals to develop a benign cancer of the pituitary gland. This gland starts to enlarge and secrets abnormally high doses of hormones. The animal tends to develop Cushing’s Syndrome, which means they lose condition, drink excessively and may become diabetic. They are more prone to secondary infections and will eventually develop laminitis. There is a lab test that will confirm Cushing’s Disease, it involves the measurement of endogenous ACTH, insulin, cortisol and glucose. What can be done to prevent laminitis? 1.) Exercise your horse more. Ride him more, drive him more, pony him, whatever it takes to reduce weight. Feed less rich feed stuff, eliminate grain if necessary. Give him an incentive to move, separate feeding area from water area. Turn him out in a herd. Movement is the key. 2.) There are some general detox programs available, I am most familiar with the Xenodetox from https://www.vitaroyal.com . This requires a specialized feeding program, available from the same company. The program is excellent, the recommendations are solid, however it is not cheap (but then again, horses are not cheap, most are 1000 lbs. luxury objects). You may also opt to get an individual detox through testing with the Computerized Electro Dermal Screening (CEDS). For more information: https:// www.hoofcareunltd.com/msas.htm This is a fairly inexpensive and very effective way to detox your horse. 3.) Avoid riding the untrained horse for prolonged periods of time on hard ground. Condition him first. Should the horse have an injury on one leg, make sure that the other hooves get excellent care, if necessary by suspending him in a sling to trim the weight bearing hoof. 4.) Horse owners often hope to save a little by having the horse trimmed less often. This actually leads to a lot of problems, especially when the hooves were not trimmed well to begin with and the horse does not move enough. Frequent trimming (depending on the horse every 2—6 weeks) is very important for good hoof health. Equally important is a correct trim that meets the horses’ physiological needs. While good trimmers may be expensive, they are certainly much cheaper than the veterinary calls that follow an acute laminitis attack. 5.) Neither humans nor horses deal especially well with conventional drugs. The side effects are often very destructive to a fine tuned body. Whenever and wherever possible, seek outthe help of a holistic veterinarian, one well versed in homeopathy and herbal applications,which are easier on the system and less likely to induce laminitis. 6.) While we can simply not avoid all stress for horses, we certainly can avoid most of bad stress. Trailering can be prepared and executed without stressing the horse. Training can happen without stress. Separating horses from each other can often be less stressful with the help of Bach Flower Remedies and a little kindness. Learn to think like a horse (The easier way, because you will be old and grey and the horse will still not have learned to think like a human . ), that will help you to reduce a lot of stress for your equine partner. 7.) There is actually some hope for the Cushing’s Syndrome afflicted horse. One are homeopathic remedies paired with a sensible diet. Dr. Eleanor Kellon runs a huge group on Yahoo with diet and drug recommendations for Cushing’s afflicted horses. As always, prevention is the best remedy, keeping your horse naturally healthy from an early age.